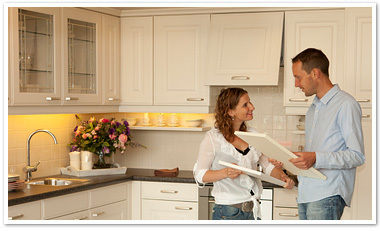 There are several methods for installing your Bendheim Cabinet Glass. Please choose one of the three methods below that best suits your requirements and abilities. Tools & Materials: Drill, screwdriver and retainer clips. Benefits: A quick and easy method of installation that can be easily performed by a DIY beginner. Concerns: Retainer clips do not prevent rattling as effectively as caulking. Remove your cabinet door and all hardware from the door. Lay the door, face down, on a flat, stable surface. Make sure to place a protective layer (such as a towel) between your work surface and the door to prevent scratching. On the back of the door, pre-drill 1 or 2 evenly spaced holes in each of the four sides of the opening to receive the retainer clips. Select a drill bit that is a smaller diameter than the retainer clip screw. 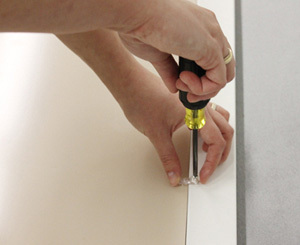 Clean both sides of your Bendheim decorative cabinet glass using a non-abrasive glass cleaner and a lint-free cloth. Insert and center the glass in the door opening. Note: The textured surface can face in or out according to your preference. 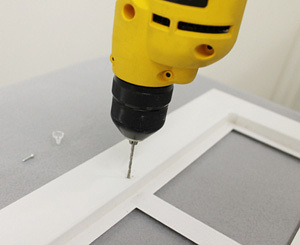 Using a screwdriver, screw in the retainer clips in their pre-drilled holes. For larger glass inserts, insert one or two additional retainer clips on each side of the opening. Your cabinet door is ready for re-installation. Benefits: Small glazing points are nearly invisible and unobtrusive. This installation method is also applicable for windows, partitions, and doors. 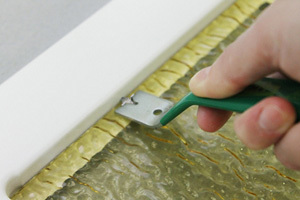 For added support, glazing points can also be used in conjunction with silicone caulking as described in Option Three. Concerns: Putty requires time to dry; please refer to the putty manufacturer's directions for application information and to determine when it is safe to reinstall your cabinet doors. Insert and center your glass in the opening. Note: The textured surface can face in or out according to your preference. Lay each glazing point flat on the glass with its point facing the door frame. Install at least two glazing points on each side of the opening. Leave a couple of inches between the glazing points and the glass corners. Using a gentle back-and-forth rocking motion, press the glazing points into the frame with a point-driving tool or putty knife. Ensure all surfaces (glass and frame) are dry and clean. Roll some glazing compound or putty in the palm of your hand until it is warm and softened, then press it around the perimeter of the glass. You can use the putty knife to press the putty. Smooth the putty at an angle with the putty knife. After the putty is dry, the cabinet doors can be painted, if desired, and hung. Click here to see Martha Stewart in a video demonstrating this method for replacing broken antique window glass with Bendheim's Restoration Glass®. Benefits: Clear silicone caulking is aesthetically pleasing and unobtrusive. It holds the glass securely in place, and prevents rattling. Concerns: This method is recommended for DIYers with experience using caulking guns. It requires attention and some skill to prevent the silicone from spreading onto the glass surfaces or the frame. Silicone is very difficult to remove from etched glass surfaces and will permanently stain etched surfaces on contact. Please use extreme caution with etched, etched pattern, and crackle glass. These glasses must be pre-masked with painters-type tape. Clean both sides of your Bendheim decorative cabinet glass using a glass cleaner and a lint-free cloth. Apply painters-type masking tape to visible sections of the door in order to protect it from possible silicone damage. Do not use a strong adhesive tape. 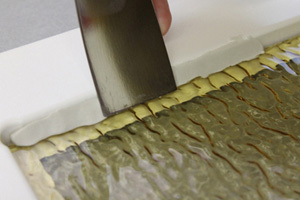 It is extremely important to protect the etched, etched pattern, and crackle glass surfaces before applying silicone. Apply painters-type masking tape around the perimeter of the textured surfaces. Be sure to apply the tape approx. 1/8" away from all four edges of the glass. This will allow the silicone to stick to this area of the glass. Do not use a strong adhesive tape. Test the silicone caulking gun by squeezing with even, consistent pressure to control the amount of silicone leaving the tube. With the door set flat, apply small drops of silicone caulking to the four corners of the opening, as well as approx. every 6 inches along the sides. Avoid using too much silicone, as it may squeeze out onto the front of the door. Any excess will have to be removed later. Insert and center your Bendheim decorative cabinet glass in the door opening. Note: The textured surface can face in or out according to your preference. Apply a continuous bead of silicone to the back side of the cabinet door. Dip your finger in water and gently smooth the silicone. Carefully remove any protective tape before the silicone hardens. Let the silicone dry. This usually takes 24 hours, although drying time may vary depending on temperature, humidity and the brand of silicone. After the silicone is dry, the cabinet doors can be re-installed. Adobe Flash Player to view this video. Download it for free using the button below.